The location of this beautifully remodeled home is only about a five-minute drive from the Arcade shopping center, which allows for easy access to all that Ojai has to offer while being just far enough from downtown to avoid Ojai Avenue’s weekend traffic and the throngs of tourists visiting the downtown village on holiday weekends. From here, you can walk or bike to coffeehouses, cafes, shops and schools, or you can make the short drive to Lake Casitas for an afternoon at the Casitas Water Adventure or a weekend of camping and fishing. On Sundays, hop on your bike and take the approximately 15-minute ride to the farmers market to stock up on local produce, honey, jams and bread. You will also want to be sure to sign up for the Libbey Bowl newsletter, since concerts in the park, Bowlful of Blues and other special events are all just about a five-minute drive or 15-minute bike ride away as well. Folks living in this neighborhood also enjoy proximity to the eclectic offerings of Meiners Oaks where you will find a bookstore, hardware store, coffeehouse, nursery, restaurants, shops, and two iconic Ojai favorites: Jolly Kone and The Donut Hole. 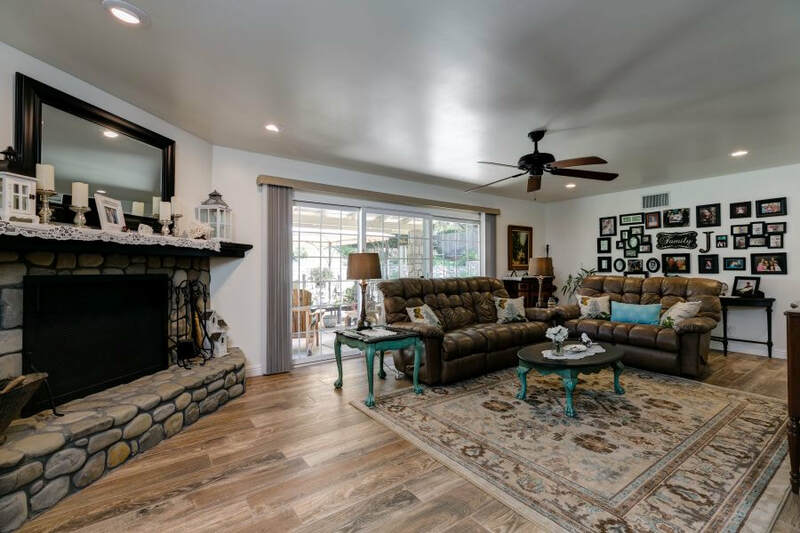 But it is not just the great location that will appeal to you here: This particular home for sale in Ojai offers other features folks in Ojai have come to expect, such as mountain views, a family orchard and amazing rock work using local river rock. Let’s start with the gated entries, since this is not something we often see in this price range. The main entry has an electric security gate bordered by beautiful, river rock pillars and walls and opening to a long driveway leading to a large parking area and three-car garage. At the other end of the rock wall bordering the front of the property, there is a second gated entry leading to an additional driveway with room for RV parking or a guest parking area. Just inside the rock wall between the two driveways, there is a family orchard where you can grow and pick your own fruit, as well as raised garden beds for a vegetable or herb garden. At the end of the main driveway, tiered, rock walls on either side of the stone steps leading to the house offer additional space for a rose garden or growing herbs and vegetables. At the top of the stairs, rock pillars with lanterns guide your guests to the walkway that leads to the covered front porch with a tile floor and room for seating, as well as the main entry. 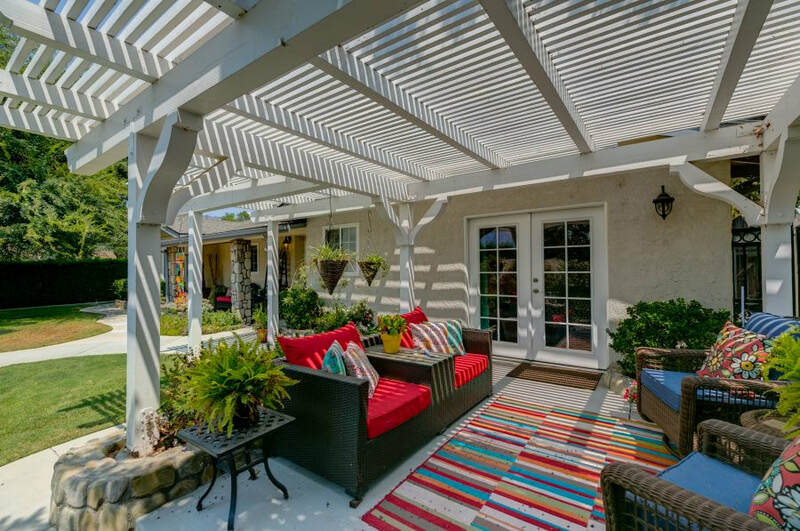 In the front yard, there is also a grass lawn and a pergola-covered patio with a large seating area. 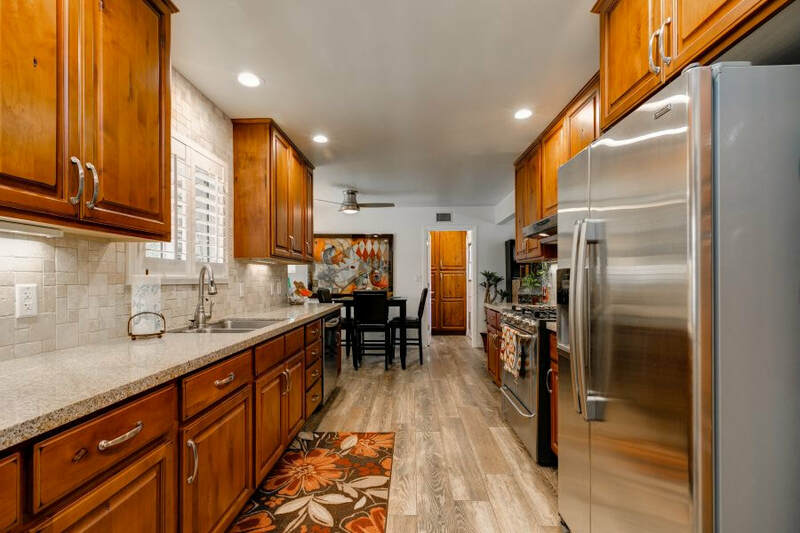 As you step inside, you will find the remodeled kitchen to the left with granite counter tops, ample counter and storage space, travertine backsplash and an adjacent dining area with a ceiling fan and space for a buffet for extra storage. Each of these spaces has plantation shutters and wood-look tile flooring, which are found throughout the house. Just beyond the dining area, there is a large laundry room with a sink, storage cabinets and a door to a side patio with a storage shed. To the right of the main entrance, there is a hallway leading to the sleeping quarters that has a linen cabinet, coat closet, and large, step-in closet with shelves and an interior cabinet. This hallway is also where you will find the guest bathroom with a tile shower. Along the hallway are two guest bedrooms, both with ceiling fans and large closets. One of the guest bedrooms has a built-in dresser, while the other has a sliding door to one of the outdoor living areas. 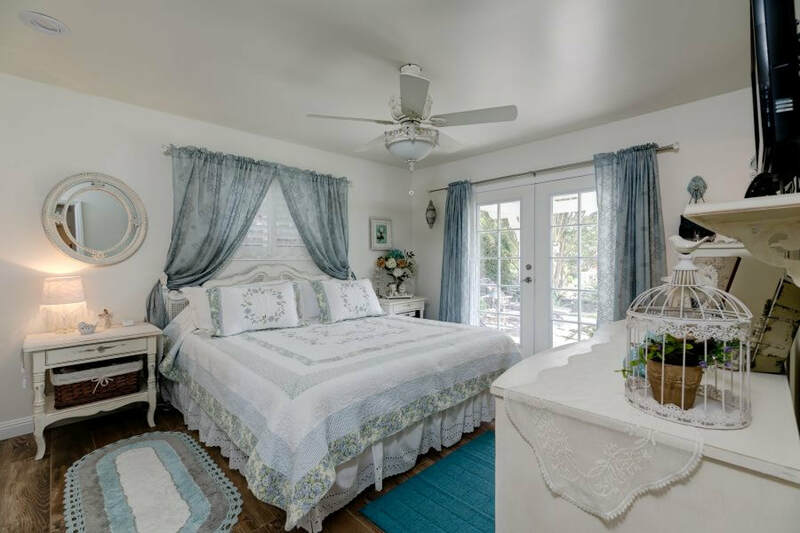 The master bedroom has a ceiling fan, two closets with built-in shelves, an en suite bathroom with a tile shower, and French doors leading to the pergola-covered patio at the front of the house. The stately, river rock fireplace is the focal point of the living room where you will also find a ceiling fan and a sliding door leading to a covered patio. Beyond the patio, the backyard offers two levels of outdoor living space. On the main level, there are two grassy areas, patios with multiple seating areas and mountain views. A river rock wall and steps separate the main level from the upper level where there is plenty of space for a vegetable garden or an outdoor entertaining area where you and your guests can enjoy the amazing mountain views. 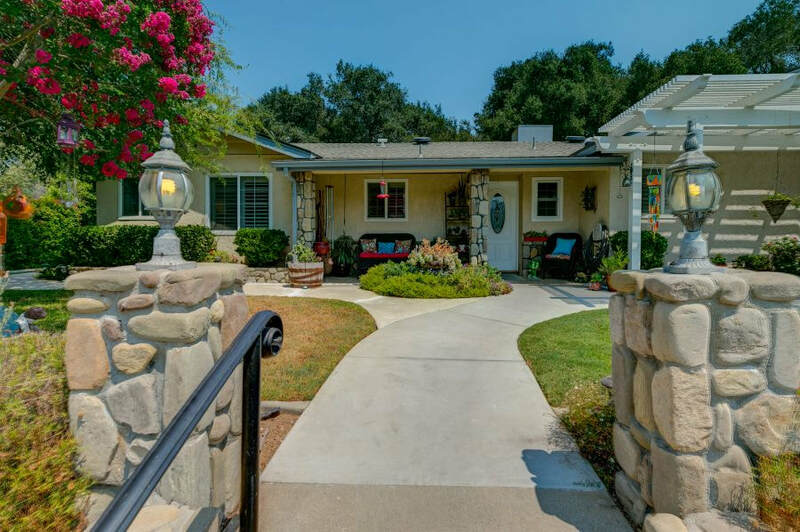 This gem is ready for you to move right in and begin enjoying the Ojai lifestyle, so don’t miss out on the chance to tour this Ojai home for sale while it is on the market. Contact Nora Davis for more information or to schedule a showing.